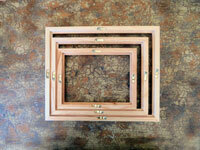 Linen art panels, canvas panels, art boards, Hughes studio easels, studio taborets, gold frames. 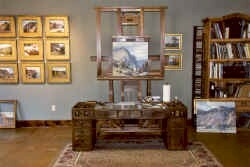 Providing Rosemary Brushes, Hughes Easels, Studio Taborets, EasyL Pochade Boxes and the best linen and canvas boards available. We cater to the artist who wants the best. New improved umbrella kit. 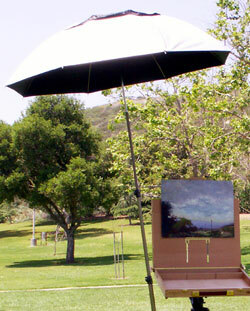 A larger plein air umbrella is available now. With a 45" diameter umbrella, weighing about 2.5 pounds and consisting of three simple parts with total folded length of 26" to carry in the luggage, this new umbrella kit is perfect for artists on the go, for French easel, Soltek and pochade with tripod easel setup. Unlike most plein air umbrellas, the EASyL umbrella can be clamped to an artist's tripod to prevent damage to the easel and its height is adjustable and can accommodate even the tallest artist. It has a silver coating on the outside that provides protection against the sun's harmful UV rays, and the black interior helps to remove reflective or excessive light. Lightweight design - Apr. 2.5 lbs. 1. Strong C clamp with universal joint. 2. A 52" telescopic tube. 3. Large 45" double canopy ventilated UV protection umbrella. 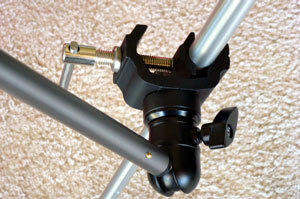 Unlike conventional umbrellas, the EASyL umbrella is clamped to the tripod leg to prevent easel damage. 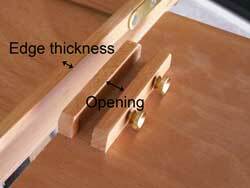 The C clamp can attach to any round tripod leg, or the square leg of a French easel. The V shape rubber pads ensure stability even on the most windy day. 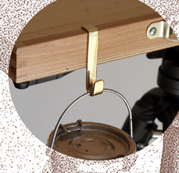 (The conventional umbrella clamp is made of flimsy plastic, originally made for beach umbrella not for artist umbrella; and with a gooseneck which is prone to break after several uses; this type of umbrella clamped on the easel will wear out itself, or even damages the easel ). To set up the whole kit, the C clamp is attached to one of the tripod leg, the telescopic tube is mounted to the support on the universal joint, and the umbrella pole is inserted to the telescopic tube. A bungee cord is attached to the umbrella and a fix position on the setup. The umbrella is made with a silver outside coating for UV protection and a black, anti-reflective interior. The silver coating reflects the sunlight, significantly reducing heat, and the black interior surface will remove reflective light, enabling the artist to paint with uniform, natural lighting. The diameter of the umbrella is 45 inches, perfectly covering the artist and painting. ( Too big a diameter will draw a strong force from the wind and can cause the easel setup flipped over under a strong gust of wind ). There are eight ventilation openings on the top of the umbrella designed to reduce wind drag. The umbrella frame is made of fiberglass providing absolute strength with minimum weight. 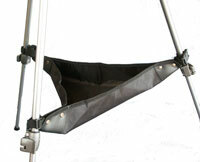 The folded umbrella, along with the telescopic tube, is stored in the supplied nylon carry bag. The carry bag has been designed to also carry a pochade tripod. The outer pocket will store the C Clamp and universal joint. The overall length when folded is only 26". The umbrella pole is inserted into the extendable telescopic tube without using a locking device. This is important as it ensures that even in the event of a strong wind gust the umbrella will not cause the easel to blow over. The umbrella is secured by a supplied bungee cord attached to the quick snap lock on the telescopic tube. 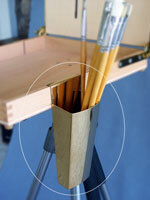 This ensures easy umbrella retrieval without danger to the easel. The picture on left shows the bungee cord is attached to the quick snap lock on the telescopic tube. 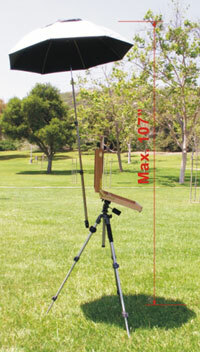 A heavy duty but lightweight professional tripod designed for plein air pochade boxes. 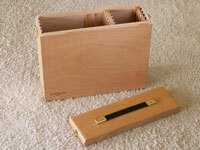 Supports any pochade box which has a standard 1/4" threaded hole at the bottom. 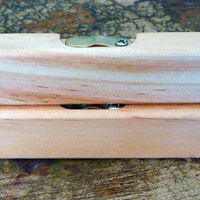 Two quick release plates (one as spare) helps mounting/dismounting pochade box quickly and easily. Long handle to tilt and lock tripod head instantly. Bubble level and compass help install tripod in a correct position. High quality Nylon carrying bag protect tripod when not in use. 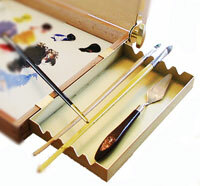 Our tripod has been carefully designed for Pochade boxes using in Plein Air painting. We eliminated functions not needed for painting so as to enhance the stability and reliability, mostly reduces weight. Lightweight and sturdy, these wet panel carriers can carry up to 20 pcs of 3/16"Gatorboard or 1/8" or 1/4" thick panel in various sizes using a uniquely designed adjustable divider. 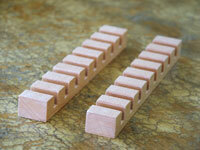 ezPORT is manufactured from imported wood that provides strength but is very light in weight. 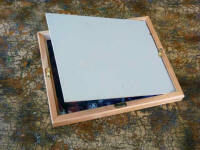 Price $69.00 for the 10" X 12"
Useful sidetray to hold your brushes, knives or other art supplies. 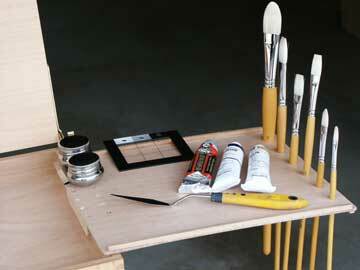 It's easily adaptable to all EASyL models and most French easels. 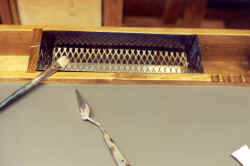 The sidetray is made of stainless steel with a beautiful gold color finish. A reusable environment friendly product. No more plastic bags ! Bring the foldable basket, collect the used paper towels, dump the towels to nearby trash bin, fold it, and re-use it over again. Price $12.99 + $3.00 flat S&H charge. 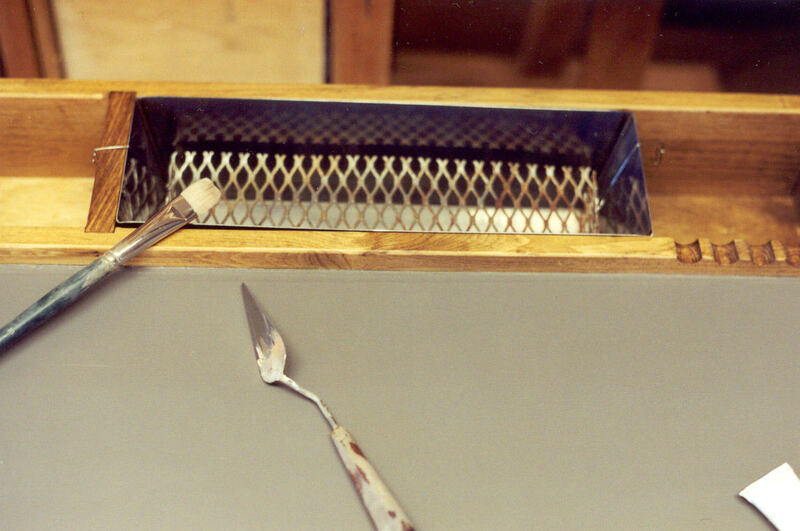 A pair of slotted racks for drying your wet panels in the hotel room while attending a workshop. Made of beautiful beech wood. It takes 8 panels up to 16 panels (back to back). Inner pocket for storing view finder. 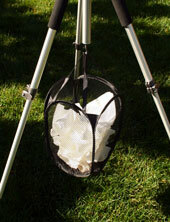 This is the larger utility bag for mounting on a tripod than any other stone bags you can find. 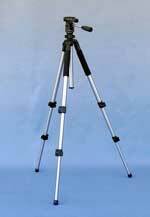 It not only helps the tripod sturdy during windy conditions but also provides ample storage space for your supplies. Size: 14" to each end, 4 inches deep. 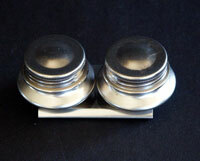 Made of stainless steel to guarantee rust-free. 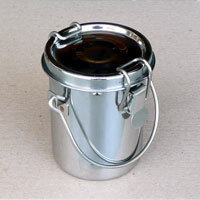 Airtight seal in the detachable lid with two snap locks for leak-proof. It comes with a deep removable straining device and a carrying handle. Large size for studio or outdoor use. Made of stainless steel to guarantee rust-free. 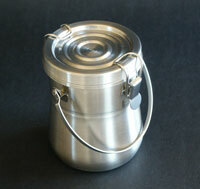 Airtight seal in the detachable lid with three snap locks for leak-proof. It comes with a deep removable straining device and a carrying handle. 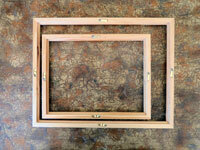 Arm Palette 20" x 26"
Made of the best Walnut with lacquered finished on both sides. VF-43 View Finder. 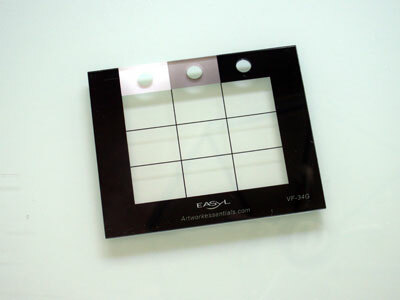 Size: 4" x 3 1/4"
The black view finder is made of plexiglass with black screen printing. VF-68GM View Finder. Size: 6" x 8"
A large view finder size 6" x 8" with color isolator to help the decision of the value and color. 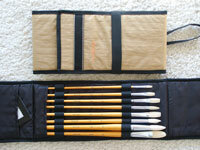 It comes with a marker pen with eraser helps the artist to render a good composition for plein air painting. 1) View Finder with two systems of grids, one third rule (darker set of lines), and golden mean (lighter set of lines). 3) A marker with eraser for rendering the view on the view finder, and see through it to continue to render the composition to the canvas. Click here for more information on View finder. VC-1521 ValueComp Size: 5-3/4" x 8-1/2"
ValueComp is designed for comparing value scales through a value scale filter. The gray-scale values are printed on both sides. Wide support plate for stretch canvas. For used on Versa, Pro, Lite or Classic. If you are ordering this item for use with one of the boxes mentioned above, please select this one. For used on Versa, Pro or Lite. 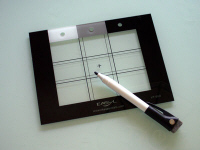 If you own a EASyL box in which the narrow panel support plate is adjusted from the rear of the lid (thumbscrews are at the rear of the lid), please select this item. 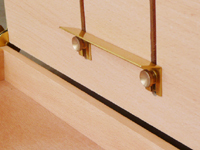 H-101 A pair of solid brass hooks. Hooks for hanging brush washer or water container. Made of solid brass. 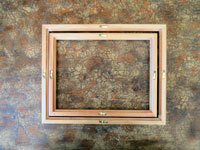 A convenient way of transporting your valuable wet panels in a compact, lightweitght, durable frame. A new equipment EASyL offers to artists travel in style and quality. The ezPak can carry two wet panels face to face up to 1/4" in thickness. Made of superior quality Birch (A furniture grade hardwood normally growth in North America or Australia), each has been professionally designed, crafted and finished with extreme quality control, clear electrostatic lacquer finish to help protection of the wood grain and give a sheen finish as well as to help the wood stands against severe weather change from warping. 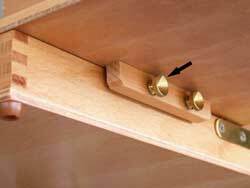 In order to reinforce the construction, a 7/8 inch biscuit joiner has been inserted in each of the four corners. 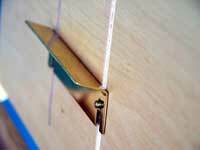 On each side, a panel can be secured in place by a set of clips, total four (or more) clips on each side. They are flush mounted in order to conveniently stack ezPaks on top of each other.